A Path With No Disguise-Red Book is the First and Beginning Spiritual Guide Book In a Series Of Seven written by Sage Warrior Merari. Showing Simple Steps To Living Life Without, "Masks," Awakening Your Spiritual Power Through Your Own Written Word, and Joined With A Chantra Discipline CD For Practice Into The Next State of Awareness. You will Love This Chantra, Finding it so Easy to Immerse Yourself, Singing It all the Time. Perfect For All Stages, Meditation Groups, From Beginner to Advanced. 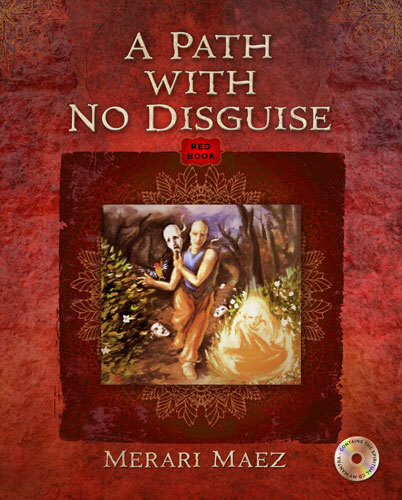 Stunningly beautiful, Illustrated Hard Back Book, "A Path WIth No Disguise-Red Book" Is a Book That You Will Treasure Always, To Remind You Of Your Own Path With No Disguise. It is time...Your Time! In America we think of meditation as a way of relaxation, not once realizing that meditation practice has its dangers as well as its enormous and well-worth-it benefits. A Path With No Disguise-Red Book and Chantra will Guide You in a Safe Way While Starting A Meditation Practice, whether you are a Beginner of this Discipline or a more Advanced Student in another Discipline. Both alone and in a Group Setting, you will be ﻿﻿safely guided to explore your inner truth. This is Not a Religion but A Pathway to Self Growth and Understanding, so Can Easily be Used In Conjunction With Any Religion. If you are looking to improve your life and what your heart truly desires to create in your life, "A Path With No Disguise-Red Book" will gently help guide you to accept and progress to the true you. To Become a Certified Teacher for, "A Path With No Disguise" Chantra Groups, as well as Receive all the Support You will need to Safely take Care of Yourself while helping others, we Now Have a Teacher's Certification Program Available. The Book" A Path With No Disguise, My mantra written by Sage Warrior Merari Copyright 2004 The Last Tribes Sanctuary. Last Tribes Sanctuary is a Sanctuary For Those Walking The Way of the Spiritual Seeker and For Teachers & Students of, "A Path With No Disguise." A Not for Profit Sanctuary.